Laserfiche announced that CRN, a brand of The Channel Company, has given the Laserfiche value-added reseller (VAR) program a 5-Star rating in the 2016 Partner Program Guide. The rating, which the Laserfiche VAR program first received in 2003, recognizes elite companies that offer best-in-class features for their channel programs. The annual CRN Partner Program Guide is the definitive directory of IT vendors that provide products and programs to the IT channel. To determine the 2016 5-Star recipients, The Channel Company’s research team assessed vendors based on investments in partner profitability, program offerings, partner training and support, marketing programs and resources, sales support and communication. In 2015, Laserfiche introduced a redesigned VAR onboarding program that emphasizes stronger business partnerships with resellers, adding to a week-long training class for new VARs, an in-depth online certification program, dedicated channel managers who provide hands-on sales assistance, and a knowledgeable presales team that performs customer demonstrations. More information about the Laserfiche VAR Program is available online or by calling 1-562-988-1688. 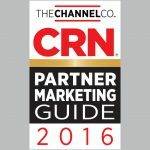 The 2016 Partner Program Guide will be featured in the April issue of CRN and online at https://www.crn.com/partner-program-guide/ppg2016.htm.